Between vaults, Kristal Bodenschatz smiles at her brother Donnie Uzelac, who's coaching her at their family's gym, Uzelac Gymnastics, in Johnstown. Two of her children jump from mat to mat, unaware of the potential danger if they get too close and she falls. 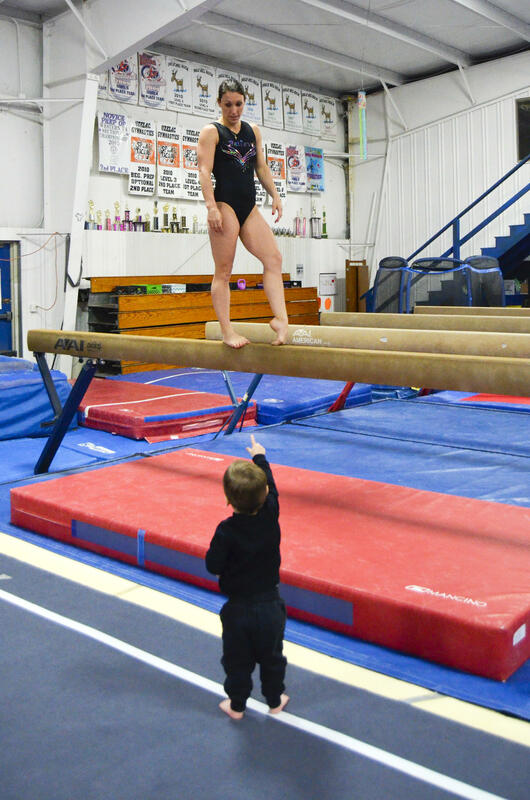 Bodenschatz takes a break from practicing front tucks on beam to talk with her 2-year-old son, Jaxson. Bodenschatz sticks her flip, then looks down at her 2-year-old son smiling up at her from below. “You’ve got to sit,” she tells him. Her family’s gym, Uzelac Gymnastics in Johnstown, is one big empty playground this morning for her youngest children. Many female gymnasts peak in their teens or early 20s, then retire. Bodenschatz was no exception, until last summer when she decided to don a leotard and chalk up her grips again at age 32. Earning a spot will be tough because the United States has a lot of depth. Bodenschatz grew up a self-described gym rat, always at the Johnstown gym where her mom worked. 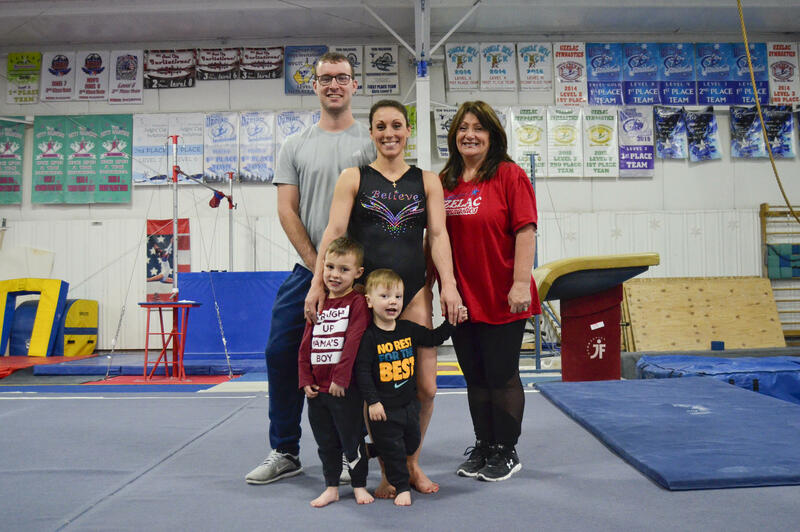 Brenda Uzelac knew her daughter could benefit from training across the state at Parkettes, a facility with a history of producing some of the country’s best gymnasts. She and her daughter, then 8 years old, made the move first. The rest of the family joined them in Allentown a year later. 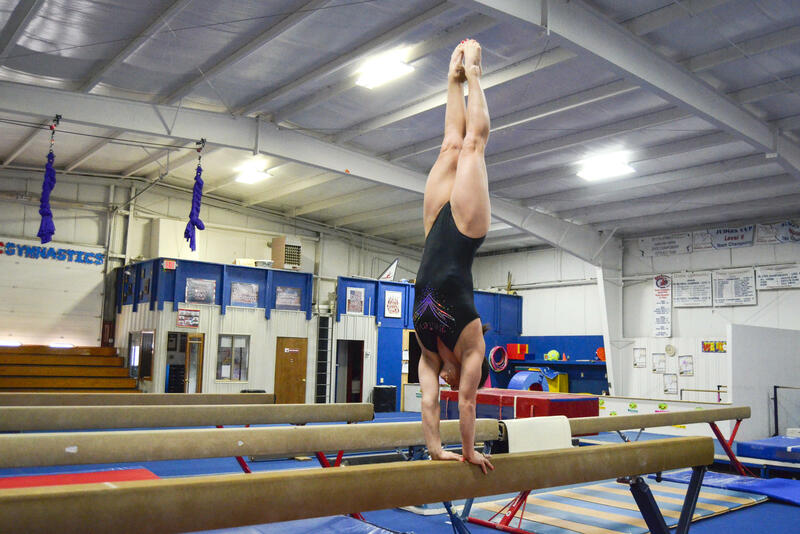 Bodenschatz performs a handstand on beam. Bodenschatz progressed really quickly at Parkettes. Her brother Donnie Uzelac recalled the day she won her first national title. The family managed to find some peace when they sat down to eat a meal, only to have more requests for autographs the second they got up to leave. Bodenschatz won national championships the next two years, but then came a string of disappointments. Her coaches pushed hard to make it to the Games, and she said that’s ultimately what led her to leave Parkettes the year before the event, feeling burnt out. She eventually went back, only to dislocate her ankle performing a release move on bars in January 2004. She didn’t even watch the Olympics on TV later that year. Still, she had a full-ride gymnastics scholarship to Pennsylvania State University. “My heart was broken, and I was not ready to continue,” she said. One unfortunate landing on a tumbling pass at practice sealed her fate. Bodenschatz went crooked in the gym’s foam pit, whacking her head on the cement side. With a bad concussion, she felt sick just trying to read. She dropped out of college to move back home to Johnstown, where she has since coached at her family’s gym. That’s where she started training again last summer, with that Olympic dream still on her mind. Bodenschatz often brings her children with her to the gym while she trains. Bodenschatz’s brother and mom weren’t sure what to think when she floated the idea of a comeback last August, but the idea made them nervous. “We were like, we’re going to be the coaches and if she gets hurt, it’s all our fault,” Brenda Uzelac said. Bodenschatz had not used her core muscles in years, plus, she’d had her appendix removed and undergone a cesarean section. So she spent a lot of time conditioning to get her body back in shape. Her ankles, knees and back still take a beating. The timing, she said, just seems right. Bodenschatz is trying to get back and even upgrade the skills that earned her gold all those years ago. Gymnastics has changed a lot since then, with a new scoring system and athletes like Simone Biles throwing difficult skills no one attempted in the late 1990s and early 2000s. A big test came at her first meet earlier this year in Ohio. She competed after just six months back in the gym. “I was prepared, but I never got nervous at a meet ever in my life until this one,” she said. Vault went well, but she fell twice on beam and did not earn the score she needs to qualify for the U.S. Classic this summer. The U.S. Classic would be her first major national competition in 15 years, and an important step on the road to Tokyo to show that she may be a contender. She’ll get another chance at an upcoming meet in June. If she doesn’t make it, she’s OK with that. Simply competing again, she said, is an accomplishment. “Doing those other things is just icing on the cake,” she said. Bodenschatz's family is a frequent presence in the gym. Her brother Donnie Uzelac and mom Brenda Uzelac are coaching her through her comeback. They are pictured here with two of her three kids, 4-year-old Ethan and 2-year-old Jaxson. Throughout her return, she has drawn inspiration from the word “believe.” It’s written in rhinestones across a leotard she often wears, and she’s selling matching ones to fund her competition travels. It resonates with young girls at the gym who see her evening training sessions. “The most important part for me about this whole experience is just to empower girls to never give up,” Donnie Uzelac said. They’re watching Bodenschatz believe in herself and find joy in this sport once again.